Drink Bottles There are 54 products. 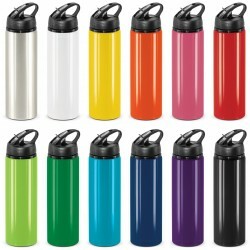 Recyclable BPA free 750ml bottle featuring the patented X-Stream® non drip self sealing lid. Can be printed on the upper and lower areas. 500ml Aluminium Bottle with carabine clip and screw top lid. Comes in 9 stunning colours. Funky and inexpensive aluminium drink bottle, that would make excellent choice for your next promotion. Recyclable 750ml drink bottle manufactured from impact and shatter resistant Tritan which is also dishwasher safe, odour resistant and BPA free. It has a secure flip valve lid with a drinking straw for easy no mess use and can be supplied with an optional carabiner.